The good folks at Information Week obviously share our frustration with the long history of Windows PCs packed with space consuming and in some cases performance crippling Crapware. Althought Microsoft is promoting Windows 8 as a ‘New Era of PC’ on everything from billboards to magazine covers…it now appears OEMs are delivering more of the same crap with new computers featuring Windows 8. 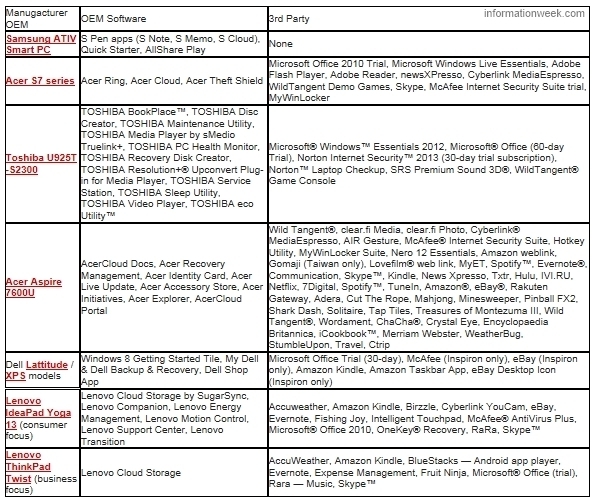 In response to an inquiry from Information Week – several major OEMs provided this list of crapware that now comes pre-installed on their Windows 8 systems. 1. Software provided by the OEM for the sake of system functionality (e.g., hardware drivers, vital system-management tools). 2. Software provided by the OEM for the sake of optional added functionality specific to the system (such as Samsung’s S Pen software). 3. Software provided by third parties (trial software). As our numerous posts regarding Crapware have well documented – this issue is driven by the all mighty dollar. But have no fear, if you have true concerns about this crapware – don’t forget Microsoft will help you remove it for just $99. Fortunately, McAfee doesn’t come pre-installed on computers purchased in Belize. We, the users, should demand to be paid a set fee for each item of crapware installed beyond the needed and basic apps. I send a very negatively worded email to each and all of the crapware people on my latest new computer. Didn’t change a thing but I felt better. Did Acer actually leave any room on the hard drive for user files? A disk containg software to remove the crapware should be included with the purchase of every new computer. If not that, then a list of the installed crapware. Why would you write an article that points negative at Windows 8 when it is pretty obvious that the issue you are focusing on is not Windows issue at all. 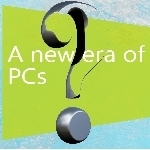 It is the manufacture of the PC. A clean copy of Windows doesn't have any of that crap on it, whether it XP or Windows 8. That's why I reformat every new computer and install only what I want on my system. So what's the alternative? Buy a software free PC but pay an extra $100 for it? Happy now? Thought not. I know, let's have ad-free internet while we're at it, just like the good old days. Only going to cost you $20 a month. Happy now? Thought not. Ad free internet? Use adblock. As for the bulkware, just reinstall a fresh copy of Windows 8. Errr… yes, I know that but that’s not my point. We all hate advertising (mostly) but without it, we’d all have to pay more for the things we use. We can’t always expect free without giving something in return. So what’s the alternative? Buy a software free PC but pay an extra $100 for it? Happy now? Thought not. I know, let’s have ad-free internet while we’re at it, just like the good old days. Only gonna cost you $20 a month. Happy now? Thought not. The moral being if you want cheap or subsidised services, there’s usually a price to pay other than cash. Articles like this are just pure garbage. @j walsh: Or Windows XP Pro. Though I did try Windows 7 Beta and thought it was light years ahead of Vista. I still use XP Pro and use the Classic settings. Just like the functionality of it. Why complain? Just buy a Mac or Linux. The crap-ware is not a big to remove and if this keeps the price down, I say go for it. If you absolutely find it offensive you can buy the Microsoft Signature machines at a higher price. Typical , your new pc filled with crapre, you don't need or use.